" Brad Guest Hosting Malloy Wednesday Night!	" Brad Guest Hosting Malloy Wednesday Night! Topics: Sibel Edmonds! ACORN Smears! Limbaugh Lies! Diebold Fraud! Mainstream Media Failure! All on YOUR Public Airwaves! 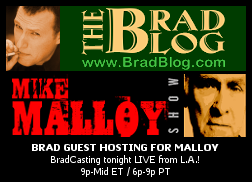 I'll be guest hosting the The Mike Malloy Show LIVE from Los Angeles tonight as Mike is doing a personal appearance in San Francisco. PHILIP GIRALDI, former CIA officer and author of American Conservative's explosive new cover story interview with FBI translator turned whistleblower Sibel Edmonds, detailing allegations of bribery, blackmail, theft of nuclear weapons technology by high-ranking U.S. officials and the Turkish and Israeli governments. EMILY LEVY of VelvetRevolution.us' on their new "DIEBOLD: RETURN OUR MONEY!" campaign, demanding the return of some $100 million dollars from the company that knowingly sold e-voting systems to the state of CA (and many other states) even though they failed to comply with federal voting system standards. PETER PHILLIPS & MICKEY HUFF, co-editors of Project Censored's new Censored 2010: The Top 25 Censored Stories of 2008-09 on the most important stories you haven't heard or read about in the corporate media. HOUR 1: Phil Giraldi on Sibel Edmonds, what the hell is going on here, and what the hell can be done about it. HOUR 2: Brad on the disgraceful Limbaugh lying across our nation's public airwaves, and Democratic failure to do anything about it. Lori Minnite on the GOP's ACORN/voter fraud lie, and the Democratic failure to do anything about it. HOUR 3: Emily Levy on the disgrace that is Diebold, and what to do about it. Peter Phillips and Mickey Huff on the most important stories of 2008 and 2009 that you never heard about! « PREVIOUS STORY "Maddow Continues Report on GOP's ACORN Witch-Hunt: The Phony 'Voter Fraud' Charges at Heart of the U.S. Attorney Purge Scandal"
"Brad Guest Hosting Malloy Wednesday Night!" Is the show going to be archived on your site or on Mike's so I can listen to it later? Brad usually gets the audio up here by a couple hours after the show, but I'd say you could almost bank on it being here by tomorrow. Hey, good luck! Always enjoy hearing you on the radio. Thanks, Elliot. Hope you'll jump into the Chat Room during the show! THE LIVE CHAT ROOM IS UP ABOVE! PLEASE SCROLL UP AND THEN JUMP IN! Somebody picked up on the strange story coming out of Montana with the cops showing up one day... it happens to be Blackwater. Sibel Edmonds needs to have people like James Trafficant arm themselves with her knowledge. We have found undetonated nano-thermite in the WTC dust. The same dust that has killed and is killing people who breathed it in. James Trafficant is still posing that he believes Arabs did 911, and that it was blowback that resulted from unbalanced foreign policy. It might have been if Arabs had actually done it. Perhaps it is the blowback that results from favoring a foreign nation that blackmails and bribes this nation's government, while it serves as an axis for the blackmarket organ trade, and while it commits terrorism on a daily basis. Nelson Mandela and Desmond Tutu have both condemned Israel for being an apartheid state. Nobody hates the Arabs more than the Zionists that are stealing Arab lands, and who depend on the demonization of Arabs to continue their plunder. Arabs don't have access to nano-thermite. We have collected from the 911 WTC dust samples of this super-weapon that is only available from labs like Lawrence Livermore.